FC Barcelona secured their 30th Copa del Rey in their history with a 5-0 win (report, highlights) over Sevilla at the Wanda Metropolitano.The blaugrana, in what has been Ernesto Valverde’s first title on the Barcelona bench, add their fourth consecutive Copa del Rey, a feat that had never been achieved before at Barça. It’s also a very important milestone for Iniesta, Messi, Sergio and Piqué, who become the players with the most Cups in Club history. The quartet now have a total of six Copas del Rey (2009, 2012, 2015, 2016, 2017 and 2018), and equal Segarra, the legendary defender of the 50's. Then, with five Cups each, we find Ramallets, Alcántara, Kubala, Samitier, Torralba and Sancho. Together with the five mentioned above, they could form an eleven of Barça players with most Copas del Rey. The four members of the current first team have won six of the last ten Cups, and have reached a total of eight finals. Furthermore, in the last decade, FC Barcelona only failed to reach the final in 2010 and 2013. It is, undoubtedly, a clear example of the great period that the Blaugrana are experiencing, with Iniesta, Messi, Sergio and Piqué as the main players. Now, they are just one Cup win away from reaching the record of the most won in Spanish football history. Ex-squad players of Athletic Club, Gaínza and Belauste, currently hold that record with seven each. 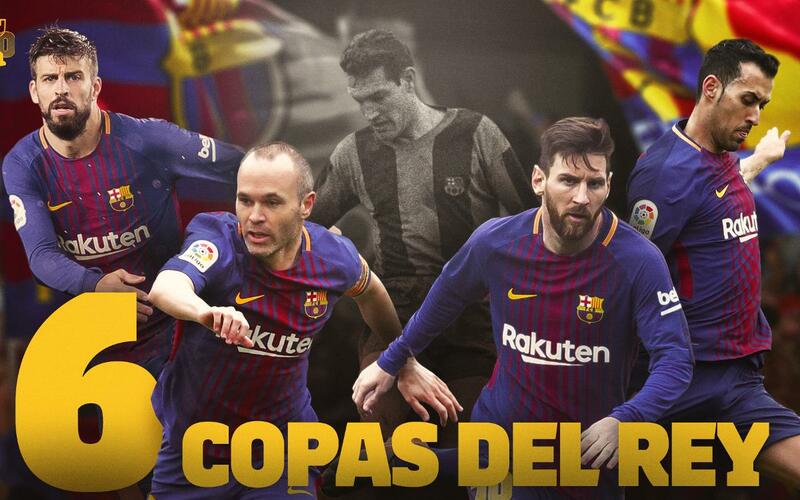 With this Copa del Rey win, five members of the current Barça squad have won their first trophy with FC Barcelona. Semedo, Dembélé, Coutinho, Paulinho and Yerry Mina are still in their debut season with the Club. The victory is a special one for Piqué and Sergio Busquets, as their 26th title means they are now only behind Leo Messi and Iniesta as the players with most titles in Barça’s history.